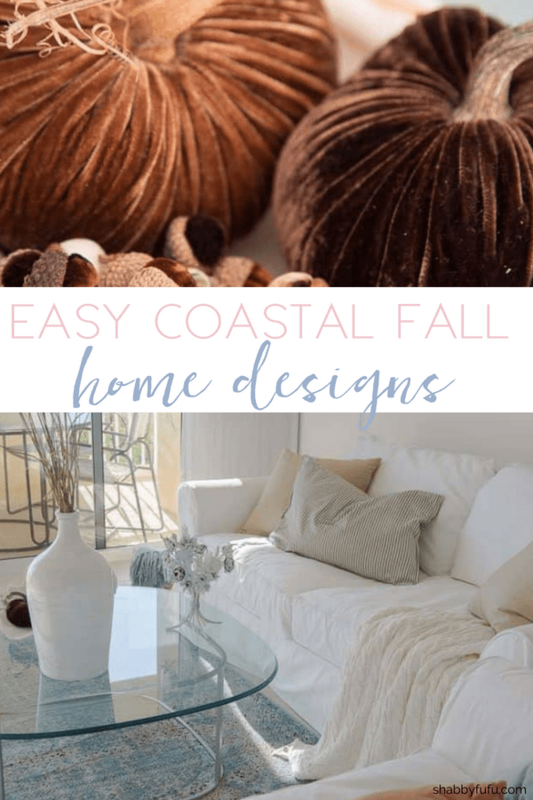 Easy Coastal Fall Home Designs To Try and when life happens and you just have to forge ahead! 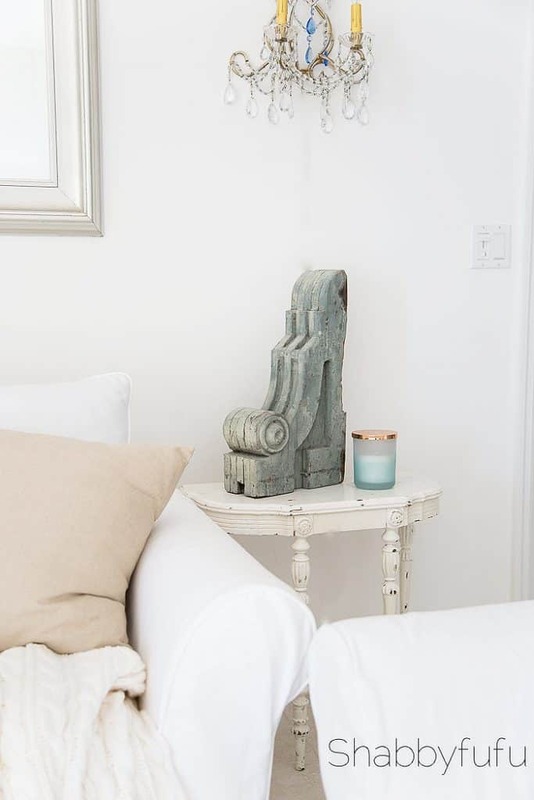 Sometimes my Girl Scout leader training comes in handy and I’ve always tried to think outside of the box in terms of decorating…so here we are in today’s home tour combining those mindsets. 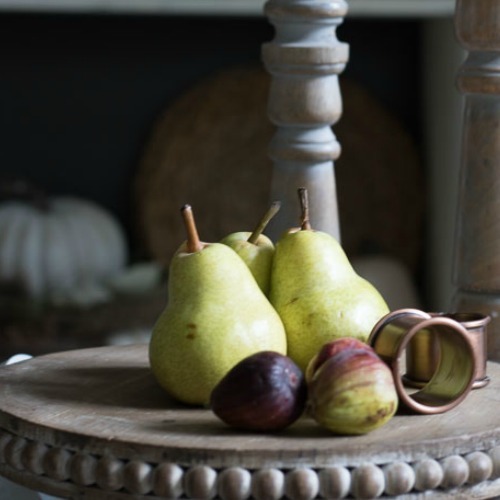 Welcome in to my version of a Foraged French Farmhouse Fall Home Tour at the beach house, a mouthful but very easy to put together. Thank you to my friend Deb of Seeking Lavender Lane for putting this tour together and inviting me to participate. If you are coming over from Sincerely Sara D, welcome in. As you know, I don’t live in a farmhouse…and this is definitely not anyone’s definition of one! 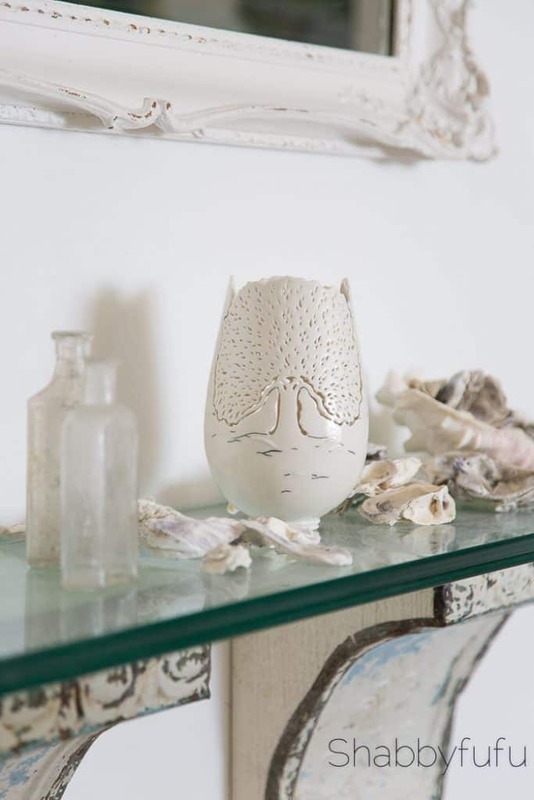 I do love the authentic French farmhouse style though and incorporate that into my designs. I’m still at our beach home and so very grateful to have made the right decision to head up here before Hurricane Irma. 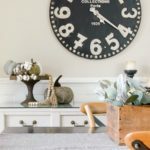 As blogging seasonal home tours go, this was planned awhile ago and the tour is sponsored by our friends at Kirklands. 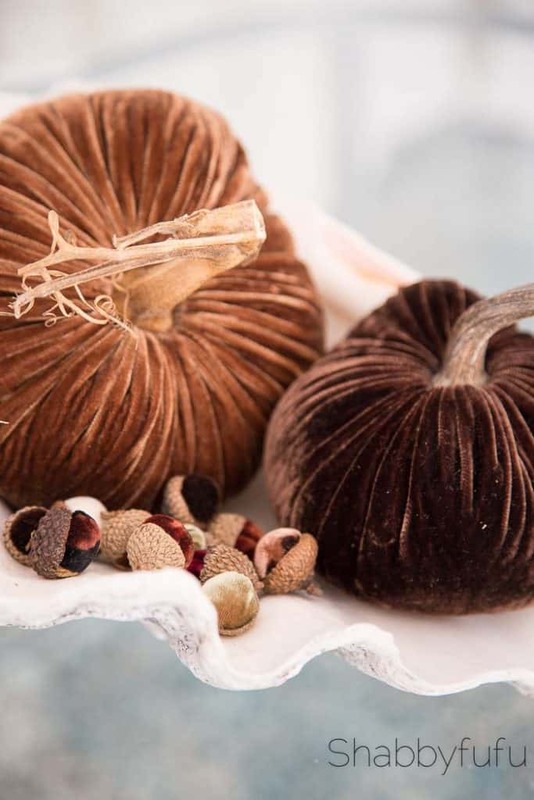 I love shopping at Kirklands and if you scroll to the end of this post they are offering a chance to win a $1,500 Gift Card to shop their stores or website. WHOOT! Affiliate links may have been used in this post for your convenience. View full policy here. This is the beach, so my colors are the same as what you see outside. 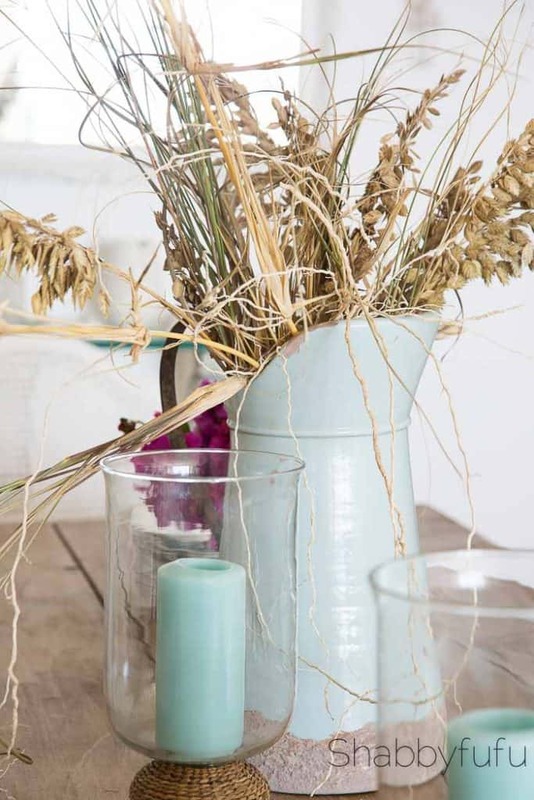 I went out to the beach after the storm and foraged for what I could find…like the seagrass in the white oversized pot. It’s understated and just seems to work for any season, but I’m thinking fall and as it dries out it will get even better. My white slipcovered sofa and loveseat are from POTTERY BARN and they have held up so well with a ton of use (and sand:-). 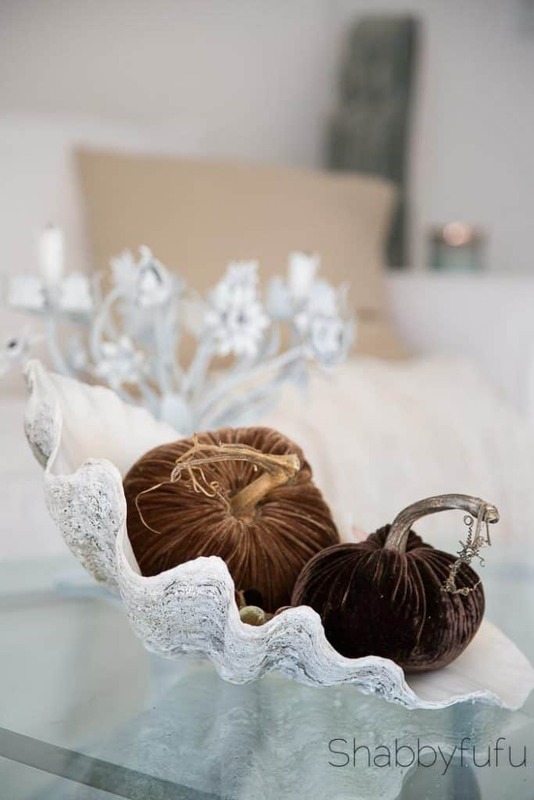 Soft velvet pumpkins and acorns add fall color and elegance and are set inside a giant clam shell on the seaglass coffee table. The coffee table was free from a client who was redecorating and too good to pass up on or toss. I love combining vintage with new, salvage with gleaming glitz and making a room more interesting without overdoing things. 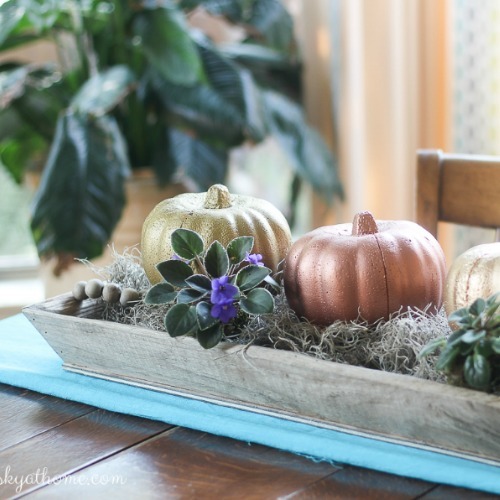 When you are adding in your own fall decor take a good few steps back if you like subtle decorating. Then edit…remove things and look at your composition as if it were a painting. 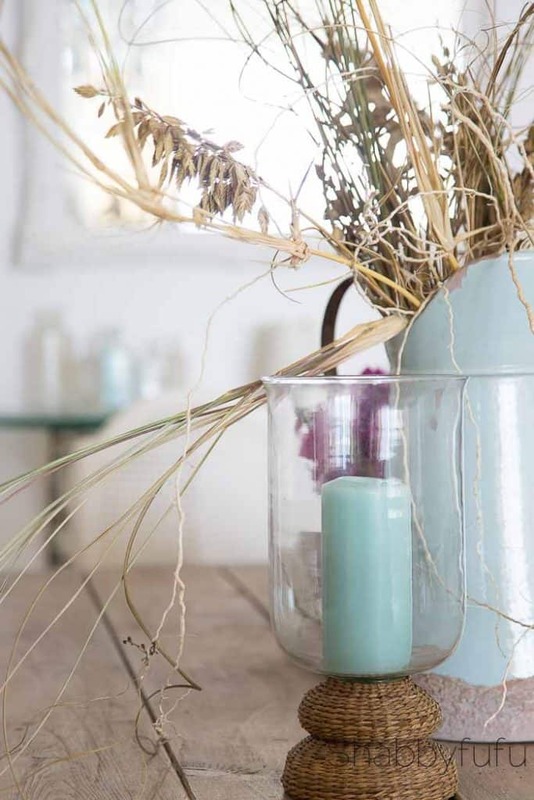 You don’t need to spend a lot or do a bunch to achieve a French farmhouse look. Much of what I’ve done here at the beach house is second-hand. 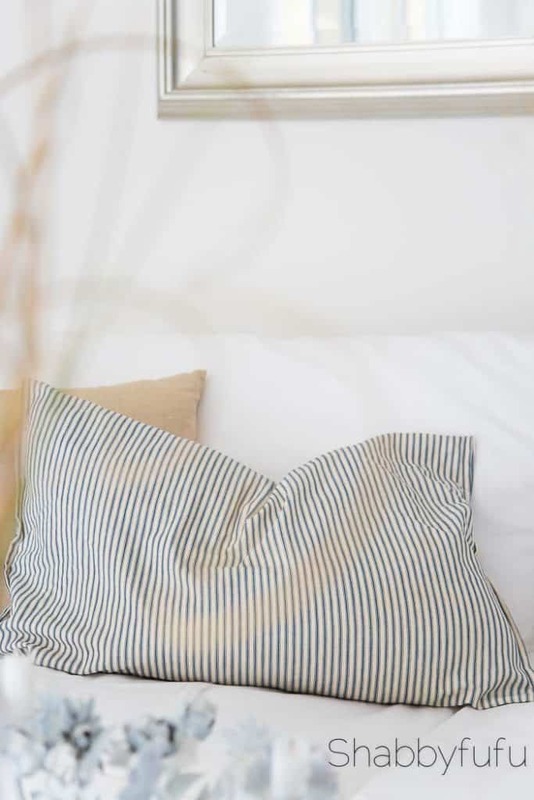 Vintage mattress ticking from the flea market was made into a soft sofa pillow and I love how versatile ticking can be. A chunky sweater throw in cream is perfect to wrap up in on a cool fall evening…or in the case of Florida – an air conditioned night. 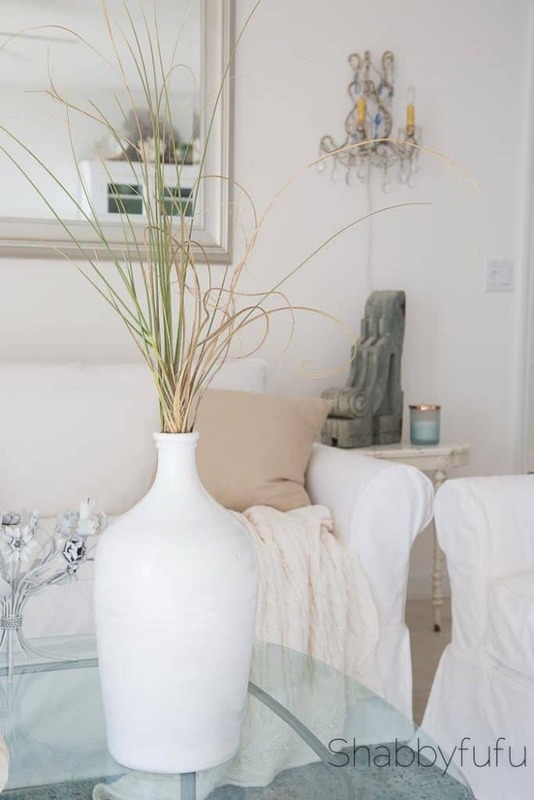 With a white or neutral decor, textures are key for interest. 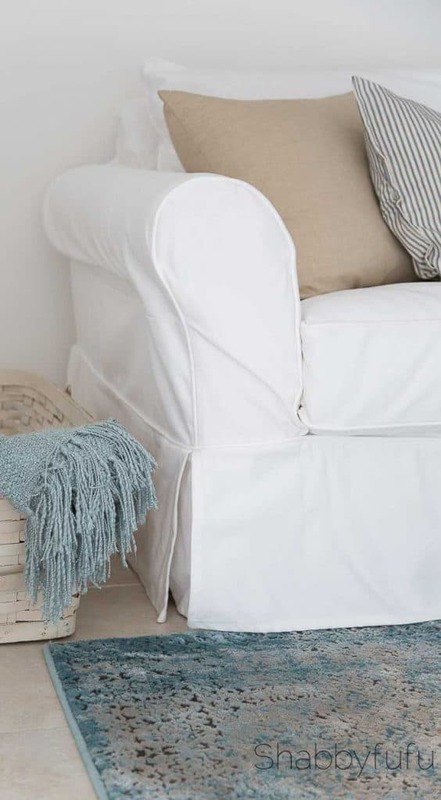 I keep a vintage basket beside the sofa with some other throws for everyone to grab. 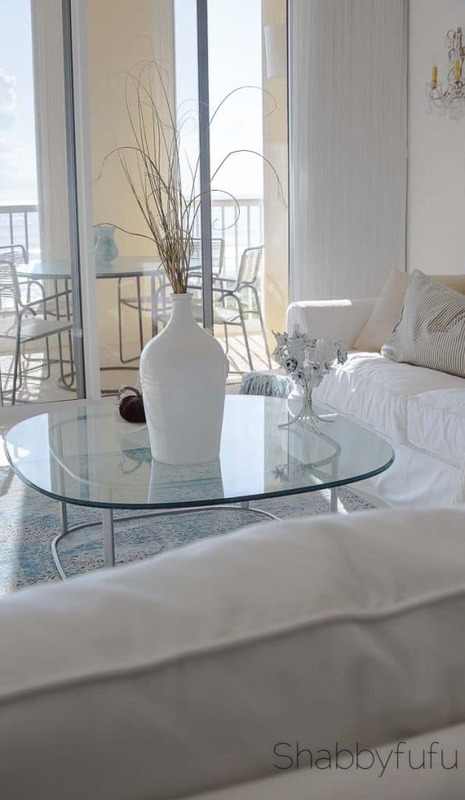 The rug defines and softens up the space and because this is the beach the floors are tile. 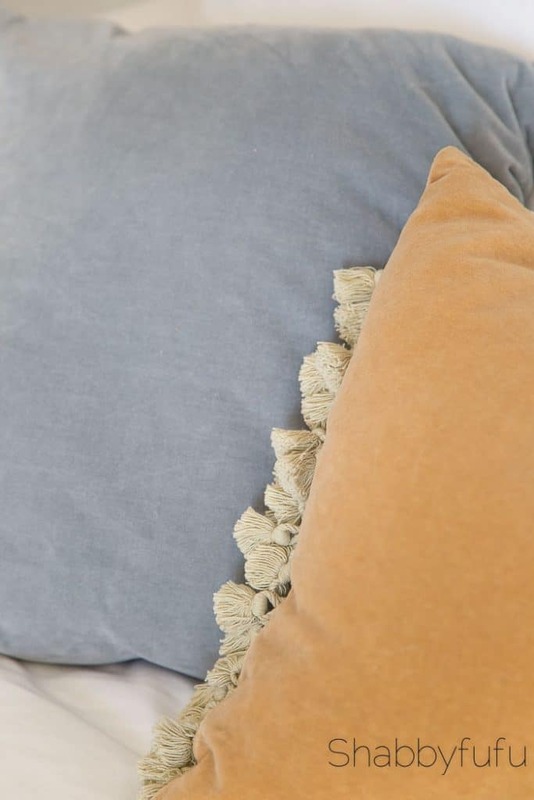 Soft velvet pillows in the colors of a cool ocean day and dark sand reflect not only the outside, but are luxurious autumn additions. 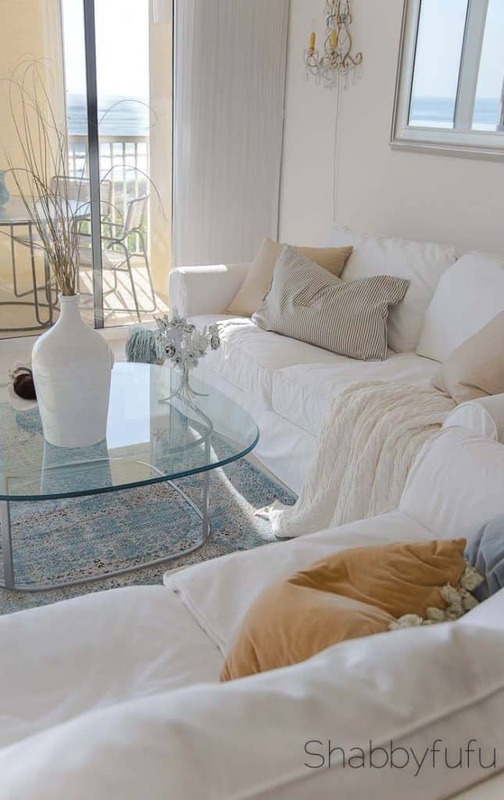 This is how we live at the beach and it’s all very comfy and cozy and informal. We lost a bunch of beach from this hurricane to erosion, and the sea oats were broken off and laying on the sand to take. 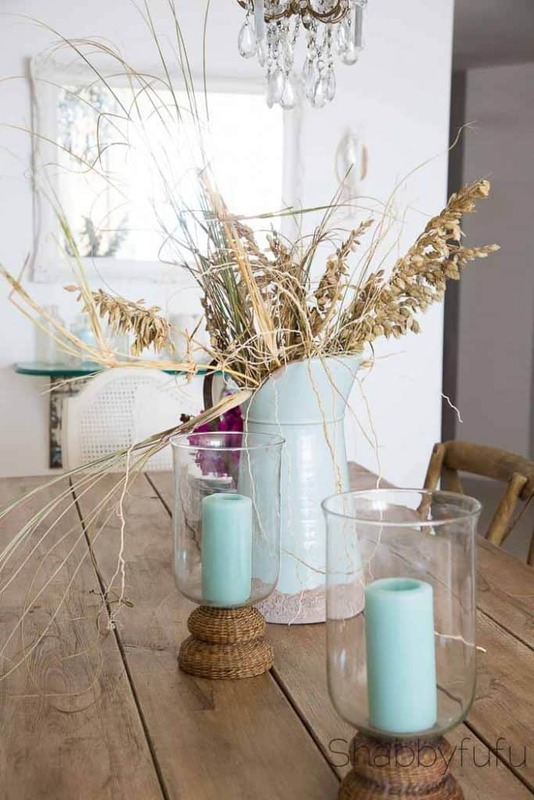 The roots of the seagrass are just so interesting and add movement and you can certainly do a similar look in your home with branches and dry leaves from outside. The hurricane candles sure came in handy during this hurricane as we lost power and I’m all about candles anyway, even in the best of times. We built this table and I finished it to look like driftwood. I have a DIY TUTORIAL for you HERE. 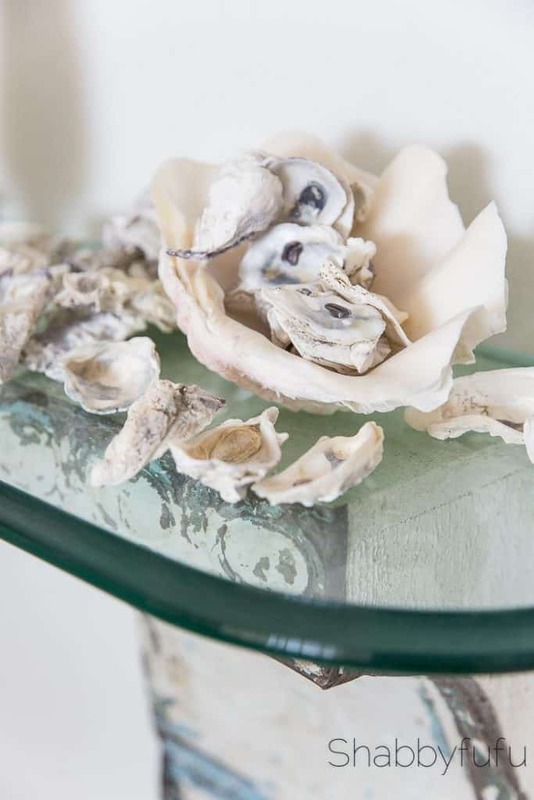 Old bottles that were dug up from the dirt over the years and oyster shells from the Intracoastal Waterway here in Florida…all cleaned up for a FORAGED DISPLAY. We did lose some trees in this storm and this vase is symbolic to me. 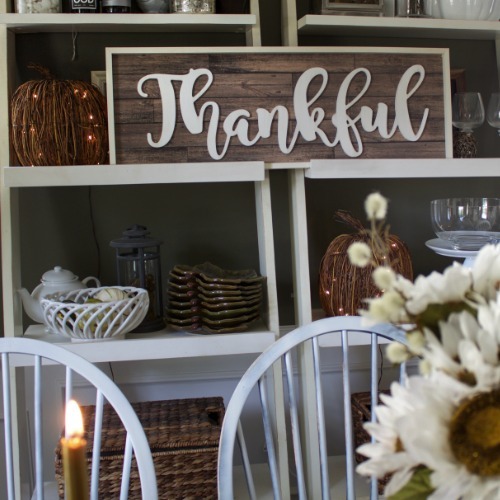 I hope that you enjoyed this FALL HOME TOUR beach house style and I’d love to hear from you if you have any questions or comments! 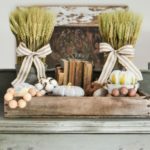 Next on the tour is the talented Kim of Hunt and Host, and please visit the other FALL FARMHOUSE HOME TOURS that my friends have to share!